City of Malolos – The National Council on Disability Affairs (NCDA) together with the Department of Public Works and Highways (DPWH) and the Provincial Social Welfare and Development Office of Bulacan conducted a one-day orientation on access audit dubbed as “Bulacan Province Orientation-Training on Access Audit: Capacitating LGUs to Implement Accessibility Law” that was held at the Francisco Balagtas Hall, Hiyas ng Bulacan Convention Center, City of Malolos, Bulacan. The event also coincided with the 35th Anniversary of the passage of BP Blg. 344 which was enacted in 1983. The one day activity was participated in by some 100 participants from the municipalities of Hagonoy, San Rafael, Meycauayan, Plaridel, San Ildefonso, Balagtas, Angat, Pulilan, Bulacan, Sta. Maria, Pandi, Doña Remedios Trinidad, San Miguel, Norzagaray, Baliwag and the Cities of Malolos and San Jose del Monte, all in Bulacan province. Participants from the national government agencies and federations of persons of persons with disabilities also attended. Bulacan Governor Alvarado (lower) and DPWH Assistant Secretary Umpa speaks before the guests and attendees of the orientation training on access audit held in the City of Malolos, Bulacan. Present during the event were Bulacan Governor Wilhelmino M. Sy-Alvarado, DPWH Assistant Secretary Tingagun A. Umpa, OIC-Director Carmen R. Zubiaga and Deputy Executive Director Mateo A. Lee, Jr. both from NCDA, Ms. Jacky Pelilio, Assistant Department Head and Ms. Paciencia Morada, PWD Focal Person of Provincial Social Welfare and Development Office of Bulacan. 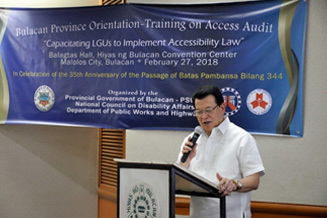 In the speech delivered by Governor Alvarado-Sy, he first thanked NCDA and DPWH for choosing the Province of Bulacan as the venue of the access audit orientation. Governor Alvarado highlighted the massive infrastructure program of the Duterte administration known as “Build, Build, Build” that will benefit the Province of Bulacan. He cited the on-going infrastructure projects such as the MRT Line 7 Project from North Avenue, Quezon City to San Jose del Monte City, Bulacan; Philippine National Railways (PNR) Clark project linking Tutuban in Divisoria, Manila, to the City of Malolos, this province, among others. “The infrastructure projects we are currently undertaking is seen to decongest Metro Manila and spur development in its peripheries and help thousands of commuters coming from Bulacan and Pampanga to travel daily to their workplaces or schools in Manila,” the Governor said. “It is important that all of our infrastructure projects must also be compliant with the accessibility law. No one is above the law, all government and business establishments in the province should be compliant with BP 344 and Republic Act No. 7277,” he said. On the other hand, the keynote message of Asec. 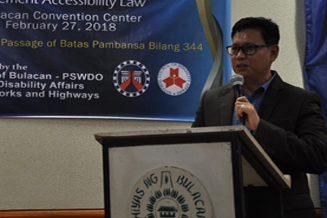 Umpa centered on the thrust of the Department of Public Works and Highways requiring its District Engineers in the Province to strictly implement the accessibility law. He said that they committed to monitoring compliance with BP 344.